Sometimes you just gotta have something sweet. You know? Something rich, chewy, and most importantly ….. chocolaty! Mind you these are not everyday brownies. Oh no. They are healthified somewhat by subbing Flax Meal in for the eggs, and applesauce in for the butter. 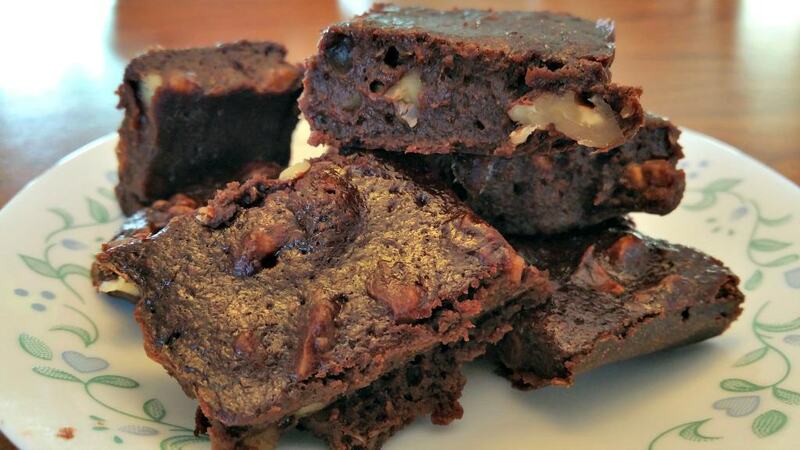 But I wouldn’t exactly call these brownies healthy. Not quite. Vegan – yes. Healthy – doubt it. Especially if you eat the whole pan like I almost did. Little moist squares of chewy, chocolaty goodness that demand to be eaten up in one sitting. So with that being said, your sugar high awaits you…. Chewy Vegan Brownies so rich, so chewy, they demand to be eaten. All of them. Now! Finally blend in flour, scraping sides, until a thick bater if formed. Fold in the walnuts if you're using them. Is flaxseed meal the same as ground flaxseed, and if not can I use it instead? Also, can I use brown rice flour? Flaxseed meal is the same as ground flaxseed, yes. I don’t know about the flour though. Emily is right about the flax seed, but I would still mix it up with the hot water, this is what makes it gel. I couldn’t tell you how it would come out with rice flour though….give it a try? Thanks Emily and Chuck! I will give it a try and let you know. Ch these brownies rock!? I’m so happy I found your site. Thank you for making the recipes so easy to follow. I have add & can get overwhelmed by some recipe directions. We husband & me have had your onion ring recipe, the creamy potato soup w/yukon gold potatoes-so yummy & now the brownie heavenly recipe. Can’t wait to make your other recipes. Your new follower from Virginia. Wow, these brownies are intense. I recommend cutting them into small squares, because they are very fudge-like. I went by the recipe and used the walnuts. Dinner guest wanted to take some home. Seriously good!